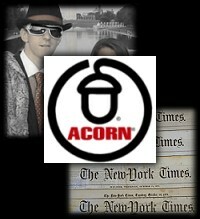 " ACORN Calls NYT Sr. Editor's Email on Misreported O'Keefe 'Pimp' Story 'Troubling and Disturbing'	"
"We have asked the Times and numerous outlets to correct their misstatements and implored numerous journalists to report on the discrepancies between the impression left by the edited tapes and the transcripts posted by the filmmakers themselves. And yes, we will ask again," wrote ACORN's Communication Director Kevin Whelan in response to my query seeking comment on our late Monday exclusive detailing the bizarre emailed comments from the New York Times Senior Editor for Standards, Greg Brock. In those emails, which we published in full, Brock explained why his paper is standing by what appear to be multiple incidents of inexcusably erroneous reporting concerning the oft-repeated apparent-fiction that rightwing activist James O'Keefe posed, or dressed, as a pimp in his now-infamous, highly-edited, secretly-taped ACORN hit videos. Brock, a Times veteran at the "paper of record" since 1995, has described himself as "the senior editor who oversees corrections." In the emails, he offers several contrasting explanations for why the paper stands by multiple reports suggesting O'Keefe wore his pimp outfit in meetings with ACORN employees. First, incredibly, he said it was because "Mr. O'Keefe himself explained how he was dressed --- and appeared on a live Fox show wearing what HE said was the same exact costume he wore to ACORN's offices....We believe him." I checked with ACORN to see if they were aware of any such video in which, as Brock claimed, "At one point, the camera was turned in such a way to catch part of the 'costume' [O'Keefe] was wearing." The ACORN Communications Director Whelan, after checking with others at the organization to make absolutely certain, wrote me to confirm that "O'Keefe was not wearing that absurd costume when he visited our offices. We know this from speaking to staff and from the videos posted online by O'Keefe himself which, when you can see any part of his outfit, show a regular dress shirt and slacks." Indeed, my own review of the released video tapes, and another from a BRAD BLOG reader since the Monday night story, confirm no such shots of O'Keefe, other than exterior shots which were inserted afterwards. O'Keefe, however, would don the outfit for media appearances to help sell the fake story, such as this one on Fox, cited by Brock in his email as one of the first reasons given for believing O'Keefe. Whelan's response echoes the findings Massachusett's former Attorney General Scott Harshbarger who, in his independent Dec. 7th, 2009 report [PDF], commissioned by ACORN as an external investigation of the videos, observed: "Although Mr. O'Keefe appeared in all videos dressed as a pimp, in fact, when he appeared at each and every office, he was dressed like a college student - in slacks and a button down shirt." As we previously reported, the Times never covered the Harshbarger report. Though it has published at least eight stories since the release of that report, suggesting O'Keefe played his pimp character in the offices of ACORN. "We have only seen the videos posted online by O'Keefe who has refused to release the unedited tapes. He also refused to release the unedited tapes or be interviewed during Scott Harshbarger's investigation," Whelan explained in his Wednesday email. "In fact," he continued, "the transcripts posted on biggovernment.com themselves reveal that O'Keefe presented himself as Giles boyfriend not her pimp - his scam involved a story about rescuing her from a violent pimp. So it would not have made sense for him to wear the costume, even within the fictional scenario he presented." Whelan also noted that "The New York Times did not have a reporter call in to the phone press conference when Scott Harshbarger released his report on ACORN" in early December. That, even though the paper received a rebuke from its own Public Editor, Clark Hoyt, in September, taking the paper to task for having been "slow off the mark" by waiting "nearly a week" after O'Keefe's first video was released before reporting on it. The paper took measures, thereafter, to improve on its "insufficient tuned-in-ness to the issues that are dominating Fox News and talk radio," Hoyt reported. Still, apparently nobody was assigned to cover the release of the independent report that found no criminal wrong-doing by the organization. (Another report from the Congressional Research Service [PDF] released two weeks later found the same, and was noted by the Times.) Apparently the Harshbarger report was not part of "all the news that's fit to print," as the Times' slogan goes. The NYTimes' Brock also went on to allege in his bizarre emails that "ACORN employees who saw [O'Keefe] described his costume," though Brock refused to produce any evidence to back up that claim either. Those unsupported claims --- along with his belief in the word of Fox "News" and James O'Keefe --- apparently serve as evidence for why "There is nothing for us to correct ... We stand by our reporting." Whelan confirmed that he was aware of no such descriptions from ACORN workers describing the pimp costume in any of their own interviews carried out following the release of the videos. If there are any accounts confirming Brock's claims, The BRAD BLOG remains unaware of them. On September 17th, 2009, almost three months prior to Harshbarger's report, Katherine Conway Russell, the Office Director for ACORN Housing Corp. in Philadelphia, published a video-taped, first-hand account of her own meeting with O'Keefe. She provided a description of how the scam worked --- or didn't, in this case, since her office filed a police report following their bizarre encounter with the Republican operative. In the video (seen at right), Russell explains what happened when O'Keefe and his partner Hannah Giles --- seen dressed similarly to a prostitute in the edited videos from other cities where O'Keefe carried out his campaign --- came in for an interview in her office. "They never said that she [Giles] was a prostitute, and he was not dressed in any unusually flashy manner," Russell explains. "Mr. O'Keefe lied to get his appointment. He was not dressed like he is on the Internet. And when we got suspicious about the questions he was asking at the Philadelphia ACORN Housing office, we called the police and filed this report," she says. A variety of either inaccurate, misleading or unfair accounts of the videos have circulated back and forth between the New York Times and other publications. We have asked the Times and numerous outlets to correct their misstatements and implored numerous journalists to report on the discrepancies between the impression left by the edited tapes and the transcripts posted by the filmmakers themselves. And yes, we will ask again. The email chain you posted with Mr. Brock was troubling and disturbing. We will be asking to meet with the Times Public Editor about the whole matter. We kept Hoyt abreast of the comments from Brock, early on during the email exchange. We have yet to hear back from him. If you'd like to request he look into this matter, his email address is Public@NYTimes.com. O'Keefe was recently arrested with three other Republican Party-connected co-conspirators, attempting to access and "maliciously interfere" with the telephone system of Democratic U.S. Senator Mary Landrieu in New Orleans. He was arrested and held on federal felony charges and has since offered an outlandish explanation for the scheme. Given his willingness to utterly misrepresent his previous ACORN scams --- regarded as "successful" ones --- hopefully federal prosecutors will closely examine his newest claims, now that he's fighting a federal felony that could result in ten years in jail. The New York Times' utter failure to accurately report on O'Keefe's past scams, even during their coverage of his current alleged crimes, is anything but helpful for those seeking the truth --- or, veritas, as the con-man O'Keefe likes to describe it. « PREVIOUS STORY "Follow-up: On NYTimes Sr. Editor of Standards Refusal to Correct O'Keefe/Pimp/ACORN Stories"
"ACORN Calls NYT Sr. Editor's Email on Misreported O'Keefe 'Pimp' Story 'Troubling and Disturbing'"
So Clark Hoyt is upset his reporters did not parrot Fox more extensively and sooner. I call that a "tell". I don't envision this punk faring too well in prison. What are the odds he cops a plea deal and rats out a few layers of scum over Breitbart, who did not conceive, orchestrate and finance the pimping and the bugging alone. Smells Rovian. But the ties the wanna be watergaters had to collegiate intel orgs points to a more systemic origin. In the running for most infuriating aspect here: how quickly this 2 bit pimp scam stampeded congress to defund ACORN. I know a court ruled against that move, but golly, I bout got whiplash. Thanks for your note. Mr. Friedman is correct, and we will be publishing a correction and apology in our Friday issue. We will be investigating disciplinary action against Mr. Brock and others involved in this story. The New York Times is proud of its reputation as the country's informal "paper of record." We are mortified that this error has remained uncorrected for as long as it has, and are grateful to Mr. Friedman and others for bringing it to my attention. I hope this helps to restore your faith in The New York Times. (*) did I forget to mention that this was in a dream? I sincerely hope that the attorneys representing ACORN have read,or will read, these articles at the following links. It is evident that there is a pattern and practice involved-on many levels. The information in these links is very revealing. Everyone should familiarize themselves with the info contained therein,imho. s past "stunts"-and it seems quite evident,to my perspective, that there is a recurrent theme of racial profiling at play here. big dan asked the other day on a related thread,,,why do "they" want us to think the msm is libral? Karen, I'm trying to figure out why they want us to think the so-called liberal media is liberal. I think you're on the right track. My reason, so far as I can figure out at this point in time, is similar to yours: they want to distort what liberal is and define liberal as what they want us to think is liberal. And then we will agree with what the "liberals" (their liberals who aren't liberal) are saying. PLUS...we won't know who the real liberals are, if they're ignoring them and telling us who the liberals are. Think about it: NOT in the liberal media are the real liberals: Noam Chomsky, Howard Zinn, Cynthia McKinney, Ralph Nader, etc...ALL the real liberals are NOT in what they're telling us is the "liberal media". If we fall for it, we'll have a distorted idea of what liberal is and who the liberals are, and the real liberals are totally ignored and off the board. If ABC, NBC, CBS, CNN, the NYTimes, WaPo, etc... are "liberal", then how come they're so different than say Democracy NOW! ??? Shouldn't they look exactly the same? And they are in no way similar. None of the guests on DN! for example are EVER on ABC, NBC, CBS, CNN...YET, we are told they are "liberal". Another HUGE thing, is they want us to think the Democrats are "liberal". What a joke that is! Continuing the wars, domestic spying, torture, etc...continuing many of the Bush policies, bailing out Wall St...that's liberal??? Do they think we're stupid? Well, yes they do, actually. And it's "framing": if they define the frame of left to right, but leave out the left, they've "framed" the debate, making the middle the left. IE: making the Democrats the liberals, and the real liberals are out of sight out of the entire conversation. All the while, "they" are telling us who the liberals are. "They" are the corporate shills like Rush Limbaugh, and all those who speak on behalf of corporations, the wealthiest few, and the military industrial complex. "They" are their paid mouthpieces. The purpose Rachel/Olbermann/Schultz serve, and it's important because it wasn't being done before, is to point out GOP and rightwing lies and misinformation. Before, on ALL corporate owned channels, they were allowed to say any lies and propaganda they wanted, unchallenged. Sure, it's not everything we want, but it serves a purpose. Sure, there are those who say they don't go far enough, or that they don't because they'd be thrown off the corporate owned airwaves (see Phil Donahue), but take it a step at a time, and keep expecting MORE and saying we want MORE, too! Another thing people don't point out and I find this astounding: Rachel/Olbermann/Schultz frequently rag on the Democrats, too! Something you do NOT see on FOX "news" is FOX ragging on any Republicans. I've seen more vicious attacks on the Democrats by Rachel/Olbermann/Schultz than by anyone on FOX "news", because FOX's attacks are based on lies and R/O/S's are based on truth, which is more devastating. For example, off the top of my head, they nightly crushed Max Bachus.